On Wednesday, at 10 A.M. sharp, Winter Break will officially be over. Back I go to the world of over-committing myself and running around Boston like a madwoman. Last night, with just a few days of peace left, I decided to see the culmination of this break’s theme come to life. That theme? Roast chicken. It was Christmas Eve in Woodside, California. Every year, aunts, cousins, professional taxidermists, and so on, gather at my grandparents’ beautiful home, complete with a horse-filled stable, a huge backyard, moss covered trees, and so many dogs and cats it’s hard to keep track. Every year we descend upon Nana Abby and Grandpa Arthur’s peaceful lives, eat copious amounts of guacamole and bask in the glory of the giant Christmas tree surrounded by gifts. This year was a little different. The cousins were in Hawaii, Aunt Sarah was in India, and Chant, our family horse, had just recently passed away. The gang was smaller this year, so we decided on a low-key Christmas. The spiral ham I’d been dreaming about for weeks would not grace the beautifully decorated table this Christmas Eve. Instead, below the polished silver Reindeer, whose antlers held flickering tea light candles, was a giant platter of freshly carved roast chicken. 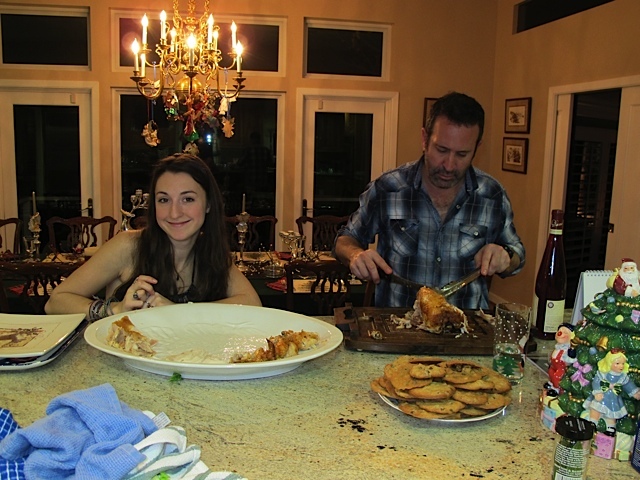 Dad showed me the ropes and by the time he was carving the actual thing, I was no longer his Sous Chef but rather the carcass picker. You try being in a delicious smelling kitchen all day and not getting antsy! When Christmas morning rolled around, the inventory under the tree was less than usual. We had decided to do a White Elephant gift exchange this year, (also called a Yankee Swap) so everyone brought one wacky gift and wrapped it without labels or cards. We all picked based on numbers we chose out of a hat…you know the deal. The trading rules were strict at first, but we all ended up haggling with each other at the end to get what we wanted. I found myself with an owl mask (don’t ask), until my very vegetarian-bordering-on-vegan aunt asked to trade. See, she didn’t want the owl mask exactly, but she had wound up with a chicken making kit and wanted nothing to do with it. As the resident foodie, she thought of me first. This was the first chicken gift of Winter Break 2012/2013. The second was just as unexpected. One morning, a few days later, I asked Dad what he was up to during the day. “Oh, nothing,” he said suspiciously. “Whaaaat do you mean?” I said. “Don’t worry about it. It’s a surprise,” he said with a little smile. I decided to shut my mouth, though in my head I was thinking, “Nikes! Nikes! Nikes!” All day I dreamed about the awesome new kicks I’d sport at the gym back at school. When 5p.m. rolled around, he waltzed into the living room with a Sur La Table bag in hand. “Here ya go,” he said, reaching in and handing me a shiny, new, state of the art meat thermometer! It wasn’t what I was expecting, but hey, I was one step closer to roasting a chicken! Later came the Spanek, an amazing cooking tool from Dad’s favorite store, Amazon. On my last night in sunny Los Angeles, I visited a childhood favorite for some good n’ garlicky Cuban food. I’ve been going to Versailles since I was a kid, always splitting the #6 (extra rice, no beans) with whichever parent I was with. Since Mom’s in Idaho now, I went with Dad. We ordered the usual, plus a bottle of Mojo: the super secret, ultra amazing sauce that coats their moist chicken. But I’ll save that for a rainy day, or rather, a super busy day when I don’t want to make a fancy marinade like the one below. Flying back to Boston, I had full cavalry of accoutrements with which to conquer the illusive beast that is a whole chicken. However, with all my tools and a month’s worth of built up gusto, nothing could prepare me for the task of cleaning the raw chicken. There I was, yesterday afternoon, standing in front of my kitchen sink, holding a whole, four pound, raw chicken…slime and all. My hands gripped it tentatively under its wings. I stared at its pink de-feathered flesh, contemplating the life of the carcass I now beheld. It was foul. Ha. I was scarred for all of 30 seconds, for the sweet smell of the marinade I had just concocted soon masked the scary looking chicken. Cover anything in garlic, and I swear all will be well. Later that night, as the chicken roasted in the oven, it filled my entire apartment building with its scent: sweet, garlicky, and juicy as all hell. At the end of the day, I felt triumphant. I mean, c’mon, a whole chicken is pretty intimidating! This roast chicken is moist on the inside and crispy on the outside. It’s economical and you will be left with plenty of leftovers. Don’t feel weird about the soy sauce in the recipe. It adds saltiness, but mostly helps the skin get all crispy and ridiculous. 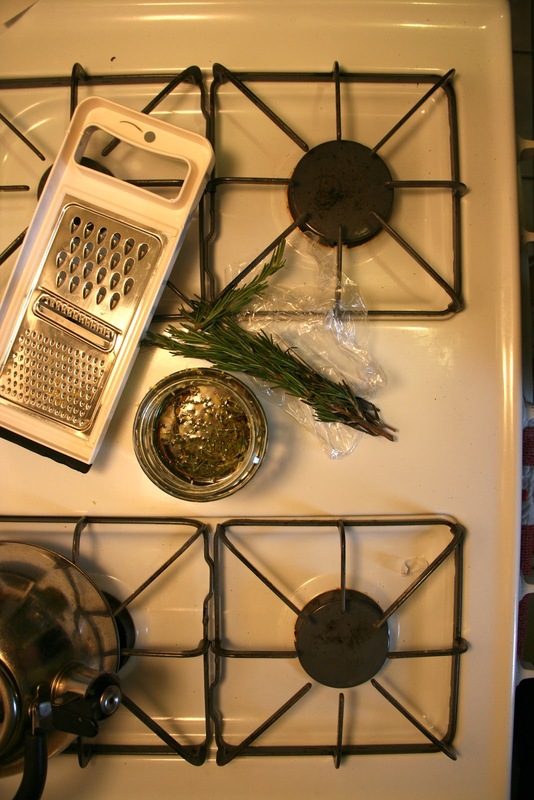 Garlic and rosemary are the resounding flavors, with just a hint of tang. 1. In a jar, combine olive oil and soy sauce. 2. Mince garlic and add to jar. 3. De-stem rosemary. You can do this easily and quickly by holding the sprig with the points facing toward you. Hold your index finger and thumb at the end closest to you and squeeze, pushing away from you, down the stem. All the leaves will fall right off. Add rosemary to jar. 4. Zest a lemon using a microplane zester (next on my wish list) or the finest option on a cheese grater. Add zest to jar. 5. Add salt and pepper, seal jar, and shake. 6. Remove chicken from packaging and rinse with cold water. Make sure to remove the innards from inside the chicken. 7. Place chicken in a gallon sized freezer bag and pour in marinade. Use your hands to coat the chicken in the garlic and rosemary. 8. Seal bag and set aside in fridge for six hours. 9. Heat oven to 375 degrees Fahrenheit. 10. Remove chicken from bag and place on Spanek, legs down. Make sure the Spanek is set in a pie dish or something like it. 11. Use the baster brush to coat the chicken in the marinade from the bag and pour whatever is left over the chicken. 12. Place in oven. Every fifteen minutes, use baster to coat chicken with the runoff in the pie dish. Use the injector to get those juices under the skin and into the meat. Check the temperature using your meat thermometer. The chicken is done when it registers at 165 degrees, after about one hour. 13. Remove from oven and let stand for 5-10 minutes. 14. Remove from Spanek, carve, and enjoy!